The gunfire testing for the F-35B Lightning II of the VX-23's Pax River, USMC. Special Tactics Training Squadron students swim during a pre-scuba class at Hurlburt Field, Florida. The attack helicopter AH-1 Cobra from the South Korean Army firing. The military parade during the French National Day on July 14, 2016. An A-10 Thunderbolt II in a training mission. An A-10 Thunderbolt II from 107th Fighter Squadron engages in a training mission at the Grayling Aerial Gunnery Range. A KC-135 Stratotanker from the 340th Expeditionary Air Refueling Squadron, USAF, refuel a French F2 Rafale over Iraq in support of Opération Inherent Resolve. The US Marine Corps MV-22 Osprey travels over mountainous terrain during a tactical exercise in Spain. Four Hungarian Gripen JAS-39 taking part in the mission « Baltic Air Policing » above Lithuania, Latvia and Estonia. 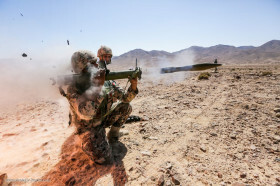 A US Army AH-64D Apache fires Hydra 70 rockets during a live fire exercise at the Grafenwöhr training area in Bavaria, Germany. Air Force Lt. Colonel Christine Mau is the first female F-35A Lightning II pilot in the program US Air Force. The Russian multi-role fighter Su-35S firing unguided rockets S-13 and internal 30 mm gun during a ground attack mission. 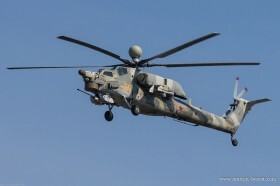 Russian attack helicopter Mi-28 Havoc crashed.